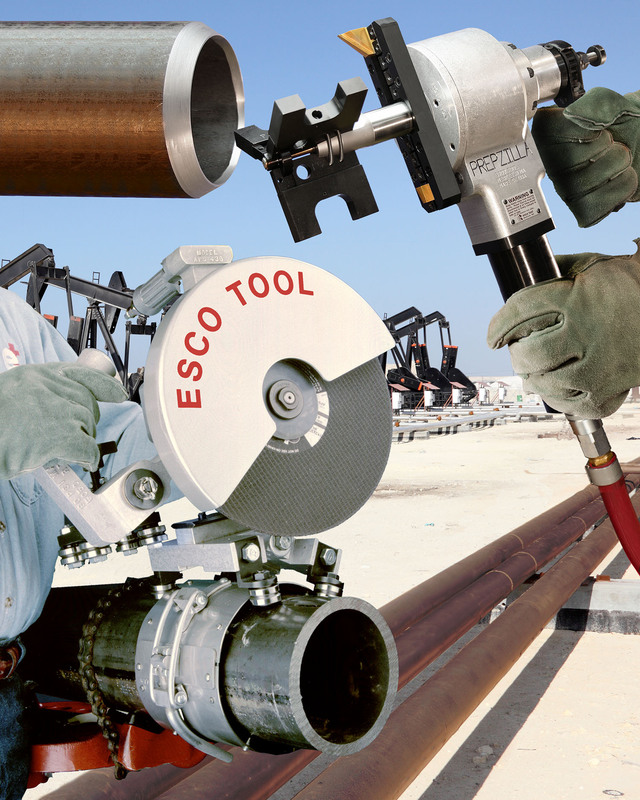 A full range of pneumatic saws and pipe machining tools that can cut all types of pipe, regardless of size and material, and prepare them for welding are available from Esco Tool of Holliston, Massachusetts. Esco MILLHOG® APS-438 Saws are offered in standard and low radial clearance models with mounting tracks and accessories to cut tube and pipe up to 60” O.D. and 4.75” thick, including all schedules of P-91 Super Duplex stainless steel. The Bevelers are available for pipe from 1.575” to 36” O.D. and can bevel, face, and bore simultaneously; operate torque-free, and pull a thick chip without cutting fluids. Suitable for the construction, fabrication, and repair of all types of piping systems, the Esco MILLHOG® Prepzilla is designed for beveling 1.575” to 8.625” O.D. pipe, the Dictator is for 4.5” to 18” pipe, and the Terminator handles 8.625” to 36” O.D. pipe. These tools are all I.D. clamping and feature a rigid blade lock system with TiN coated T-15 tool steel cutter blades and can perform any angle of prep. Esco MILLHOG® APS-438 Saws and MILLHOG® Bevelers are priced according to model and are available for sale or rent.